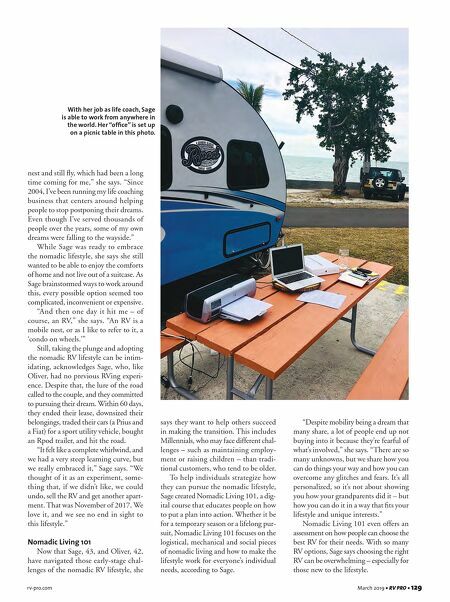 rv-pro.com March 2019 • RV PRO • 129 nest and still fly, which had been a long time coming for me," she says. "Since 2004, I've been running my life coaching business that centers around helping people to stop postponing their dreams. Even though I've served thousands of people over the years, some of my own dreams were falling to the wayside." While Sage was ready to embrace the nomadic lifestyle, she says she still wanted to be able to enjoy the comforts of home and not live out of a suitcase. As Sage brainstormed ways to work around this, every possible option seemed too complicated, inconvenient or expensive. "And then one day it hit me – of course, an RV," she says. "An RV is a mobile nest, or as I like to refer to it, a 'condo on wheels.'" Still, taking the plunge and adopting the nomadic RV lifestyle can be intim- idating, acknowledges Sage, who, like Oliver, had no previous RVing experi- ence. Despite that, the lure of the road called to the couple, and they committed to pursuing their dream. Within 60 days, they ended their lease, downsized their belongings, traded their cars (a Prius and a Fiat) for a sport utility vehicle, bought an Rpod trailer, and hit the road. "It felt like a complete whirlwind, and we had a very steep learning curve, but we really embraced it," Sage says. "We thought of it as an experiment, some- thing that, if we didn't like, we could undo, sell the RV and get another apart- ment. That was November of 2017. We love it, and we see no end in sight to this lifestyle." 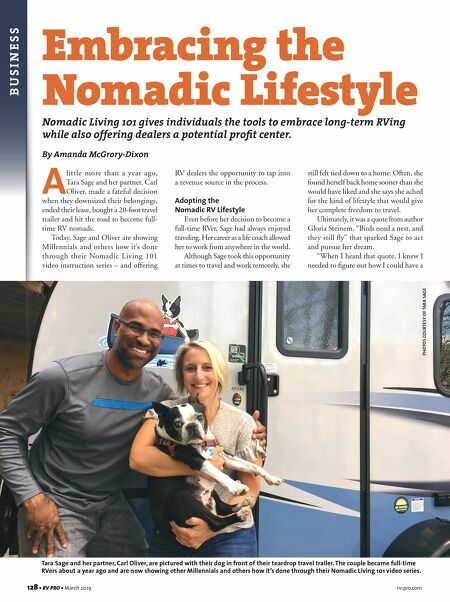 Nomadic Living 101 Now that Sage, 43, and Oliver, 42, have navigated those early-stage chal- lenges of the nomadic RV lifestyle, she says they want to help others succeed in making the transition. This includes Millennials, who may face different chal- lenges – such as maintaining employ- ment or raising children – than tradi- tional customers, who tend to be older. To help individuals strategize how they can pursue the nomadic lifestyle, Sage created Nomadic Living 101, a dig- ital course that educates people on how to put a plan into action. Whether it be for a temporary season or a lifelong pur- suit, Nomadic Living 101 focuses on the logistical, mechanical and social pieces of nomadic living and how to make the lifestyle work for everyone's individual needs, according to Sage. "Despite mobility being a dream that many share, a lot of people end up not buying into it because they're fearful of what's involved," she says. "There are so many unknowns, but we share how you can do things your way and how you can overcome any glitches and fears. It's all personalized, so it's not about showing you how your grandparents did it – but how you can do it in a way that fits your lifestyle and unique interests." Nomadic Living 101 even offers an assessment on how people can choose the best RV for their needs. With so many RV options, Sage says choosing the right RV can be overwhelming – especially for those new to the lifestyle. With her job as life coach, Sage is able to work from anywhere in the world. Her "office" is set up on a picnic table in this photo.